Isn't religion to blame for most of history's killings? "[Man] has made a graveyard of the globe in trying his honest best to smooth his brother's path to happiness and heaven." "Religion has caused more harm that any other idea since the beginning of time. There's nothing good I can say about it." The idea that belief in some kind of god is to blame for most of the world's killings is popular but incorrect. (The notion is mostly popularized by the Crusades and Inquisitions). Even if true, it would be illogical to conclude that such actions prove the Bible false, or prove that the Bible motivated those events. The issue of the Bible's veracity is independent of religion and independent of anyone who claims to have acted on God's behalf. It is simple enough to study the Bible and then judge if it was the most likely motivator. Religious motivations can never be completely divorced from political ones and, as such, suffers this drawback: religion is often to politics what a battered wife is to an abusive husband. She's repeatedly told to not speak up and not intervene (e.g. "get your God, commandments, prayer, Bible...out of schools") until the day the husband gets in trouble. Then the trouble is blamed on religion because she didn't speak up or didn't intervene (e.g. "Where was your God during the Columbine shooting? What good did the Bible do?"). Such is often the relationship between church and state in modern America. "To the corruptions of Christianity I am indeed opposed, but not the genuine precepts of Jesus himself. I am a Christian in the only sense in which he wished anyone to be, sincerely attached to his doctrines in preference to all others..."
"The name of Christ has caused more persecutions, wars, and miseries than any other name has caused." Many people dislike organized religion in general, not always or not just Christianity. Some people blame organized religion for most of history's killings. It is also sometimes claimed that more people have been killed in the name of Christ than for any other reason. Is this true, and is Christ or his teaching to blame? It is true that in the world's history of beliefs and practices, there have been many wars and cruel inhumanities conducted in the name of different religions and ideologies. Those notorious events stand rightly condemned. The total number of deaths estimated to lie at the feet of humanity's poor practice of Christianity is approximately 17 million. This number would include ancient wars, the Crusades, the Inquisitions, various European wars during the Middle Ages, and witchcraft trials. On the other side of the table, atheistic ideologies and worldviews have been responsible for their own share of wars and inhumanities. Before we tally up that number, let's make clear what, if anything, the scriptures had to do with deaths attributed to Judaism and followers of Christ. Now, when an ancient war was carried out and someone said it was in the name of Christ or the God of the Bible, on what basis do we believe them? In other words, who is to say which killings God or the Bible authorized? The importance of this point is that the terrible killings of the Crusades, Inquisitions, and early Reformation periods (all killings popularly attributed to "Christianity") are not outlined or even suggested in the Bible. The greatest proof of the Bible's innocence of this charge is probably the thousands of Christians during the Inquisitions who were burned at the stake for just possessing a Bible or reading the Bible for themselves. 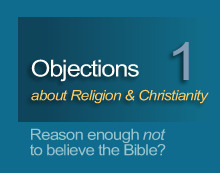 I assure you the Bible doesn't advocate banning itself or killing all its readers. The Bible never ordered the slaughter of Muslims, Jews, Protestant Christians, or Catholic Christians. Orders for those deaths came from men who used others' admiration of the Bible to achieve their own selfish or political ends. European believers did respect the Bible during medieval times, but few copies existed, most people couldn't read it, and many were dependent on a single denomination's control of its interpretation. For lack of having read the Bible or studied it for themselves, people were misled into believing what others had told them it said - a situation which has ironically become descriptive of today's critics who claim to be the most outraged by the atrocities of those ancient times. Nevertheless, for the sake showing the proportionately small amount of killings which lay at the feet of humanity's sometimes poor practice of Christianity, I am willing to include even deaths due to ignorance of the Bible (arguably not the fault of Christ or his teachings). Now let's look at the number of killings attributed to non-Christianity, including atheism and other anti-religious forces. To be conservative, we will limit the count of anti-religious killings to the last seventy years or so. Fourth, Cambodia suffered more than 2 million killed in its own bloody transition to anti-religious communism after United States forces suffered the fall of what was called Saigon and then largely withdrew from the region. Thus it is erroneous to state that organized religion, or the name of Christ, is the cause of all or even most of history's killings. Quite to the contrary, modern history shows that the killings associated with the denial of divine authority outnumber the killings of professing Jews and Christians on an order exceeding 66 to 1.